Starting Tuesday, Nov. 27, the City of Kent will close a portion of South 228th Street for approximately two years for construction work. “This is to continue work on the grade separation/overpass between 6th Avenue North and 72nd Avenue South,” the city announced. 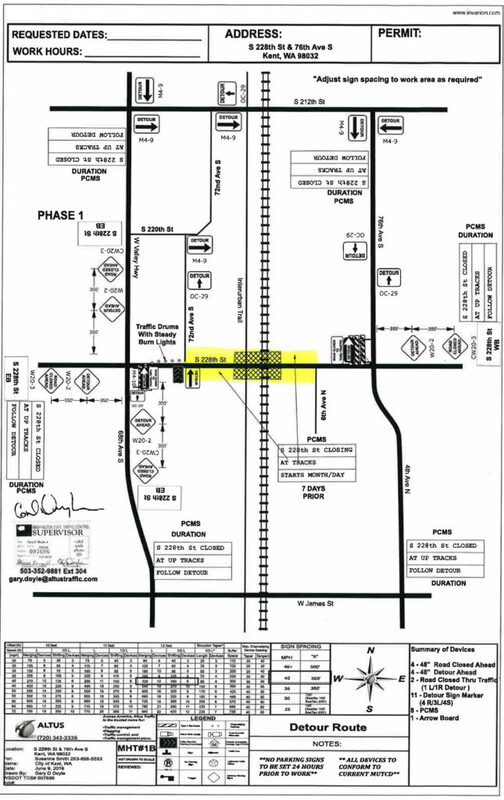 Detour routes will be in place at 76th Avenue South/4th Avenue North, and at 68th Avenue South/West Valley Highway, directing drivers to use South 212th Street during this time. Interurban Trail will remain open for the next several weeks but will be closed for the majority of the project. Contact Public Works Engineering at [email protected] or 253-856-5500 with questions.